Auction Decorating: Have fun with artist's models! Have fun with artist's models! You have your furniture in place, the rug on the floor, and some great lighting. Now for the details. Every room needs decorative layers, and some of them should be fun. You want something to give you a little smile, or maybe something that will attract the eye of your guests. In this classic living room, the addition of two artists models standing on the tray add some fun. Just imagine how you might shape their stance depending on your mood. One day they are standing straight and somber, and the next they are seeming to dance across the room. Stair Galleriesin Hudson, NY has an auction coming up March 10th and 11th. It includes some fun objects. 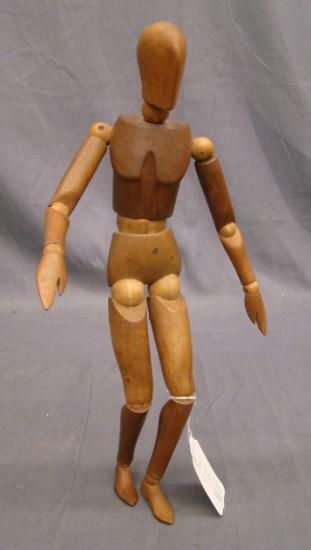 This early 20th century wood articulated artist model on a stand could be your own artistic expression! This is Lot 16 and has an auction estimate of $300 - $400. Perhaps more interesting is this American folk art carved and painted African American man. It's more primitive in design, but very intriguing. It needs a stand, but I think would make a nice design pair with the previous artist's model. This is Lot 8 in the Stair Galleries auction, and has an auction estimate of $200 - $400. To put potential pricing n perspective, these next two artist models sold at Copake Auctions in Copake, NY. This French wooden artist's moderl had an auction estimate of $50 - $75, and sold for $165. 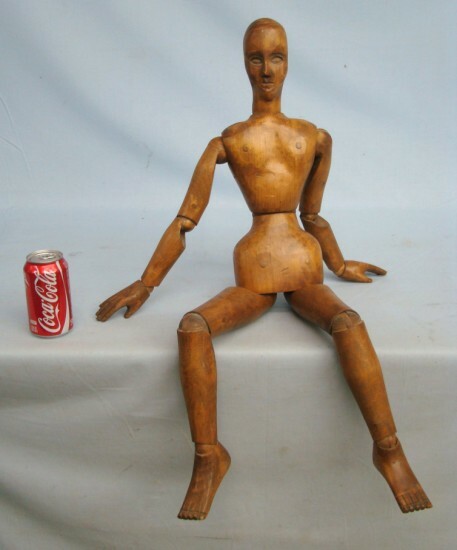 This provocatively posed artist's model was 32 inches tall, and would make a statement. This has an auction estimate at Copake of $150 - $250, and sold for a whopping $800! Clearly it was desirable. I think artist's models are fun, and have lots of posing potential. They are sculpture, art and decoration rolled in to one! Table top architecture ' at auction'!